New mommy Kim K. has turned over to the blonde side! The "Keeping up with the Kardashians" reality star and sisters are well known for their curvy bodies and brunette manes, but Kim decided to give herself a little makeover and went blonde for autumn. She was seen leaving a friend's barbecue where she debuted a slightly shorter do with black roots and blonde lenghts. It isn't the first time Kim ditched her trademark brunette locks, in 2009 she lightened her hair as well. She first fooled her fans by wearing a blonde wig and looked almost unrecognizable. At the Teen Choice Awards later that year she revealed the real thing saying "This time it's for real guys! I went blonde!!". It was a change that left her fans divided, some loved the sunkissed look on Kim, some thought the blonde manes took away her exotic and mysterious appeal. 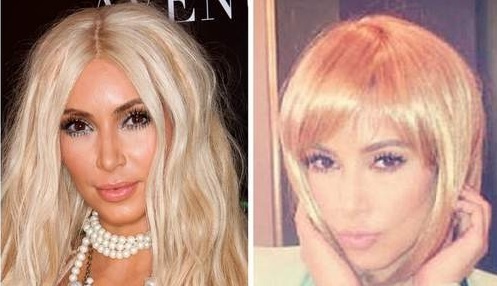 Later on Kim proved that blondes do have more fun by rocking out some crazy blonde wigs to fool the paparazzi and to dress up for Halloween. This time however the dye wasn't a complete surprise, Kim has been hinting on Twitter that she missed her blonde hair and her "Threw Back Thursdays" referred to pics from her golden era. Besides, Kim isn't the only sister who went blonder this year. 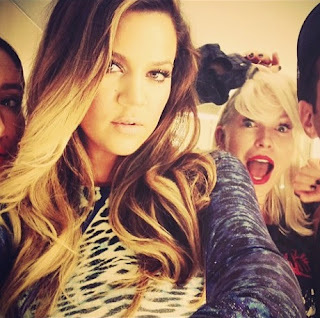 Khloe has been seen with ombre hair for quite some time now and went even blonde past summer. Older sister Kourtney decided to add some highlights to her black manes, and even added some bangs. Are The Kardashians starting a new blonde trend? They are certainly stepping out of their "long black hair extensions" comfort zone, since starting their reality adventure. So what do you prefer on Kim? Do you like the blonde change? Or should she keep her trademark dark locks?